The Mark V diving rig was used by the U.S. Navy for deep sea and salvage diving from 1916 through the early 1980s. Designed for intensive diving operations and to provide maximum physical protection, the Mark V allowed divers to work at much deeper depths than had previously been possible. With its iconic copper helmet, the Mark V is the best known and most recognizable of the Navy’s diving systems. 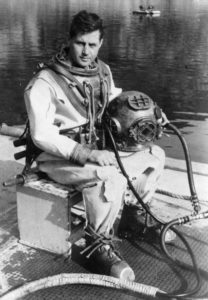 The Navy did not have standardized diving gear during its early years; they used an eclectic assortment of helmets, suits, pumps and hoses designed by different commercial manufacturers that were often incompatible, complicating the simplest of diving assignments. In 1905, the Navy’s Bureau of Construction and Repair developed the Mark V diving helmet based on Siebe-Gorman’s Davis Six-Bolt Admiralty Pattern helmet used by the British Navy. Early helmets created by A. Schrader’s Son and the Morse Diving Equipment Company also influenced the Mark V helmet design. In 1916, modifications to the 1905 design improved its performance and diver safety. A rudimentary communications system was installed and a regulating exhaust valve that permitted some control of atmospheric pressure inside the helmet was added. By pressing a button to operate this valve, a diver could change the amount of air inside his suit, thus allowing him to adjust his buoyancy. A safety catch was also incorporated into the helmet to ensure it stayed attached to the breastplate. Additional improvements to the exhaust valve and communications system were implemented in 1927, and the weight of the helmet was reduced to increase diver comfort. Following these updates, the design was standardized and changed negligibly for the duration of its use by the Navy. The first U.S. Navy Mark V helmets were manufactured by Morse and Schrader; after the attack on Pearl Harbor, the Diving Equipment & Salvage Company (DESCO) and the Miller-Dunn Company began producing them as well. The Bureau of Ships issued a standard set of plans specifying the details of their construction, and although small variances existed between manufacturers, they did not affect the interchangeability of Mark V gear. The standard Mark V compressed air diving helmet, the Mod 1, is made of spun copper and features four sealed glass viewports. Two goosenecks (angled pipes) project from the back of the helmet; viewed from the back, the left is the diver’s telephone connection and the right attaches to the diver’s air supply hose (umbilical). A non-return valve present in the air hose connection preserves pressure inside the suit if the air supply is cut, preventing the diver from being fatally forced into his helmet by the water pressure. The helmet interfaces with the rest of the suit by screwing into a breastplate that inserts into a rubber gasket built into the diving dress. The rubberized-canvas dress with wrist cuffs creates a sealed, watertight environment; the diver dons canvas gloves, heavy leather boots, and a heavy weight belt to complete the assembly. A recirculating version of the standard helmet, the Mark V Mod 1 Helium helmet, was required when divers used a mixed-gas breathing mixture (versus breathing compressed air). The mixed-gas helmet was outfitted with a carbon dioxide absorption canister that removed CO2, reducing the amount of fresh gas needed. The complete mixed-gas Mark V rig weighed about 300 pounds, 100 pounds more than the standard Mark V rig, to counteract extra positive buoyancy created by the helium. The Mark V helium rig was used for the first time during the salvage of USS Squalus (SS-192) in 1939. The Mark V was the standard diving system used by the Navy for all salvage operations through the early 1980s, when it was phased out in favor of the Mark 12 Surface-Supported Diving System.